“Beethoven’s Irish songs have long held a fascination for me and others interested in performing and studying the music of Ireland. 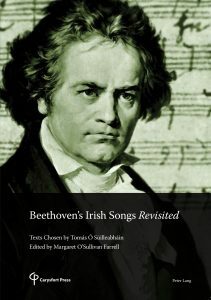 The legacy which Tomás Ó Súilleabháin has created by his artistic and sympathetic realignment of the settings now brings Beethoven’s work to the fore, confirming for it a unique and enduring position within the Irish song repertoire”. Beethoven’s seventy-two settings of traditional Irish airs constitute his most prolific output in any genre. The arrangements were commissioned in the early nineteenth century by the Scottish editor and publisher, George Thomson, who sent airs, but no texts, to Beethoven. Poetry, mostly by less well-known poets, was attached to the finished settings before publication by Thomson, and perhaps therein lies the reason why the songs never achieved the popularity which they deserve: many of the poems have been judged to be of inferior quality. In this edition, the first in which all Beethoven’s Irish folksong settings are published together, the late baritone, broadcaster and musicologist, Tomás Ó Súilleabháin, selected texts, mostly by Burns and Moore, which he felt were more appropriate to the airs and to Beethoven’s settings. Tomás Ó Súilleabháin (1919-2012) from Doneraile, Co. Cork, was a civil servant for all of his working life, but he had a parallel musical and literary career of considerable influence and versatility lasting more than sixty years. A baritone, he sang in many Radio Éireann broadcasts of original works and Irish folksong arrangements by composers Seoirse Bodley, Brian Boydell, Frederick May, Geoffrey Molyneux Palmer, Seán Ó Riada and others. Many of these performances were premieres and had been composed especially for Tomás, who often collaborated with the composer by sourcing and translating texts. Referring to this collaboration with emerging Irish composers, the musicologist and author, Axel Klein, in The Life and Music of Brian Boydell (2004), described Tomás as “one of the most important champions of contemporary Irish music”. Margaret O’Sullivan Farrell studied piano with Elizabeth Costello at the Dublin Municipal School of Music where she was awarded the top prize, the Lorcan Sherlock Gold Medal for advanced piano performance. She went on to study for the BMus Degree at UCD. While there she conducted the St Stephen’s Singers madrigal group in concerts, festivals, broadcasts and competitions. She specialised in piano accompaniment and duo playing, as well as becoming a lecturer in Keyboard Studies at the DIT Conservatory of Music and Drama, a post she held from 1980-2011. Margaret has appeared in concert with many eminent instrumentalists and singers and has broadcast extensively with them on RTE radio and television, on UTV and on BBC Northern Ireland. She was executive producer of a recording of Beethoven’s Irish songs Revisited by staff, students and alumni of the DIT Conservatory in 2014.